Reese Witherspoon’s Draper James announces plus size fashion collab with Eloquii is here to stay with their Spring 2019 line release. Reese Witherspoon’s Draper James became a special part of our fashion lives last year with it’s collaboration with Eloquii for the Spring season. 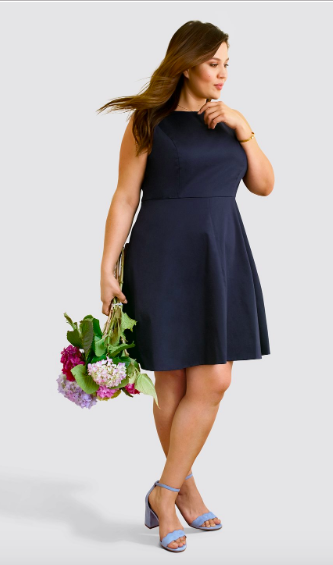 So much so, that they have decided to launch their own plus size collection within the Draper James collection. With Draper James known for it’s southern charm and feminine polished vibe, if the Eloquii collab had you geeked then you need to check out what Draper James has for you! Launching with this news via their blog, Draper James is bring plus sizes into the mix up through sizes 24! Classic wrap dresses are always a go-to look for events and activities! With fluttery sleeves to match the flow of the skirt, this dress is all-around feminine and sweet. Taking a twist on our everyday denim, Draper James turns heads with this fun, casual and energetic piece! If you love some good ruffles, but not wanting to get crazy with them, this is the one for you girl! What better way to be cute, flirty and all for spring other than a short sleeve sweater dress that has a perfect pleated skirt and chic button accents! Added with some neutral shoes or even a spark of color, this dress can fit to so many styles! The best part of this launch is that the collaboration is here AND that they paid attention to cut, silhouette, and styling. Staying true to the Draper James brand, this collection hits on the feminine, polished, and playful options. Could we use more items from this launch? Oh yes… With this being just he beginning, we are going to be watching how Draper James bring plus sizes into the fold. As designers are realizing that plus size fashion is a real destination and lifestyle, we are curious to see how this collection and launch evolves throughout their business. Is this an exciting addition? Are you going to start to check them out and learn more? Did you see some essentials that you need?